AJAX offers users a seamless way to work with your interface, no waiting for whole pages to load. jQuery has a set of tools to make it super simple to implement. We will walk you through how to use jQuery to communicate databse using jquery’s ajax method in asp.net. Each example will feature the same requirement, and that is to obtain and display the Customer details relating to a specific CustomerID selected from a DropDownList on a page called Customer.aspx. 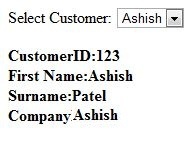 Once table created, need to insert some data into tblCustomer. Now, we first call ASPX File by jquery AJAX to get customer data into customer.aspx page. create new page called fetchcustomer.aspx. put below code in fatchcustomer.cs file . Now, we call Web service to get customer data into customer.aspx page. create new web sevice called fetchcustomer.asmx. put below code in fetcustomer.cs file (web service file mostly in App_code folder) . My accomplice and I actually enjoyed reading this weblog post. Keep it UP!!!! I’ve recently started a weblog, the information you provide on this website has helped me tremendously. Thank you for your whole time & work. how to call asp.net web service in phonegap. please can you give download link of your project ? This article is excellent. It helped me a lot. Thank you very much! Best post found on the subject until now. And I’m looking for a long while. Thanks a lot, Ashish. 1. I not understand what is @cid. 2. My samples working. DropDownList binding. Bu detals not write on the page. 3. Can you give download link of your project ? I do not understand why this much coding and calling is required w.r.t asp.. instead theses all task can be done with php using simple html inputs’. Thabnk you alot for this post. I work all day without any result and nw you hepls me. Thnak you master. This is simple and Smart Example I Like It You Are Great Bro Keep It Up…..